Typical store interior in mall made from architectural design. Colours and materials can be easy modify so this scene can be customize to fit your needs. Architectural drawings included. this formats makes it usable in 99% of 3D software programs. every format of this model has been verified in software that is designed for. 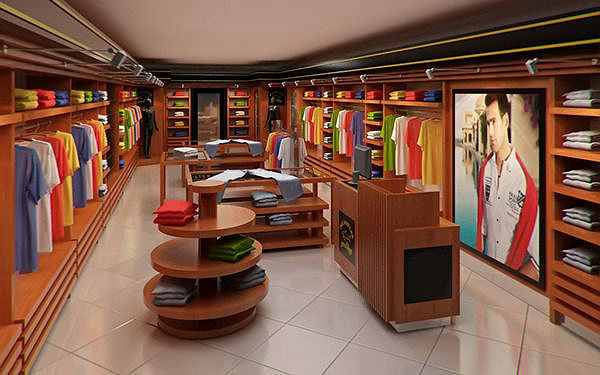 By using this model in your project you are sure to please your client with a typical design of a clothing store. Also check out my other store models, just click on my user name to see complete gallery. * By buying this model you declare that you understand that much work has been done to this 3D model to look the same in any 3D program but final render effect may depend on the 3D software you are using, resulting from the fact that every software diffrently handles lights and advanced materials. Also you can be sure that models designed for older versions of the same software will render the same in the newer versions. Nice set-up, after a spending a while getting used to the scene it was easy to use it.